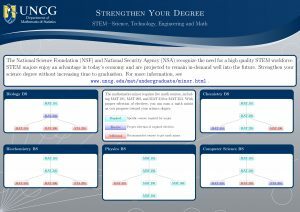 Science major with math minor The National Science Foundation (NSF) and National Security Agency (NSA) recognize the need for a high quality STEM workforce. STEM majors enjoy an advantage in today’s economy and are projected to remain in-demand well into the future. Strengthen your science degree without increasing time to graduation. (6 s.h.) Two additional MAT or STA courses at the 200 level or above that count toward the MATH major. (9 s.h.) Three additional STA courses at the 300 level or above. For more information and guidance, contact the Department of Mathematics and Statistics Director of Undergraduate Studies.